I have a yard sale once or twice a year. It helps our family make extra cash and keeps our house purged of unnecessary and no longer needed items. I don’t really attend many yard sales because it seems I always need to clean out clutter, and I don’t want to add to it! However, I have found some nice things at an occasional yard sale or estate sale. Just remember, one person’s junk is another person’s treasure! Here are some tips and tricks that I have learned along the way for successful sales! We have several large blue bins that we used for moving in the past. Now we use them to store yard sale items as we collect them throughout the year. As we purge our closets and drawers every few months, we just add to the bins, and when it’s time for the yard sale, we are ready to go! Determine a good time of day. In my experience, Fridays are better for sales than Saturdays! It seems backwards, doesn’t it? I usually run my sales on Friday and Saturday from 8 a.m.-12 noon. The peak time is between 9 and 10 a.m., generally. With my last sale, I had to keep a watch on the weather for weeks until I finally found a week that looked almost rain free! A fall sale is always nice on a crisp, cool day; however, it was almost 100 degrees during my last sale, and I had one of the best crowds ever! Click here to read, Seven Ways to Brighten a Home on a Rainy Afternoon. Hold the sale in a good location. If you don’t live in a location for sufficient yard sale advertisement, finding an alternate location at a relative’s home is a great idea. Participation in a group sale or a neighborhood sale is also savvy for location purposes! Advertising is an expense, but in my experience, it helps to actually have customers attend your sale! Some newspaper businesses will even give out yard sale kits to help you get started with your sale. It includes things such as helpful tips and signs. Place signs in prominent locations. A sign at the sale location, on main highways, and neighborhood streets directs customers, and signs are also just another terrific form of advertisement. Be willing to negotiate prices. When I sell things, I am looking to move the items! It’s better to sell for a lower price than to not sell at all! These days, most people want yard sale items practically given to them, so don’t be too disappointed if you don’t get top dollar for that item you thought was SO valuable! Just remember, you put it in your yard sale junk, so it’s not super valuable to you anymore! I sell most items for one or two dollars with some exceptions, of course. Begin with plenty of change. Thirty dollars is a good amount for beginning a sale. Three dollars in quarters, twelve dollars in ones, and three fives is a great start! Organize and sort the items. Organization is a huge plus for the sale. Tables are a must. No one wants to attend a sale where things are just thrown on top of tarps. Organize items into categories, hang clothing, sort toys, and make packages of items to sell as sets. For example, instead of selling one children’s book, sell five in a set. Instead of selling one toy car, place several in a baggy and sell them as a package! Also, as the day progresses, reorganize and compile items for continued positive presentation. Be friendly to the customers and show them how an item works. Help customers see a reason for purchasing the item if they are interested, but never pressure people to buy. If they want to buy, they will! Some people love just rummaging through a box! You can ever lower the price and have a box where everything is a quarter or fifty cents! Make sure you have plenty of helpers. Keep your home doors locked, keep any children in a safe place, and hide the money in a secure location. Donate leftover items or keep them for another sale. Second hand shops and thrift stores welcome donations, and if you save your items, you can sell them at another yard sale or consign them. Consignment sales are great for children’s clothing, toys, and other items. Communicate to the customer that all sales are final! Believe it or not, I have had people attempt to return items after purchasing! Now, if the item is broken, that’s one thing, but under normal circumstances, yard sales aren’t for returns! 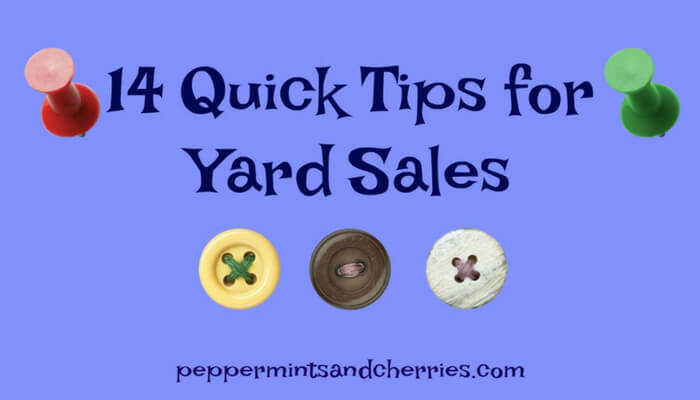 I hope these tips are helpful to you in preparation for your next yard sale! Happy sales! If you have further suggestions for yard sales, please list your ideas in the comments! Do you have any chores that you dread completing? Click here to read about my three least favorite chores!